Almost two years after the release of Black As DeathIRON MASK return with a brand new studio album! The band developed by Belgian guitar wizard Dushan Petrossi performs at a high level again, concentrating solely on their strengths. 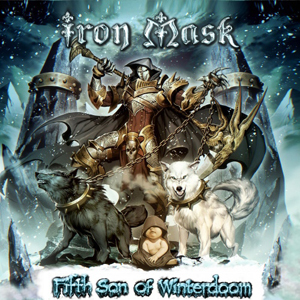 The new piece of work is titled Fifth Son Of Winterdoom features 12 songs that couldn't be more catchy and captivating. "This time we really put focus on writing very catchy songs. From the concerts we played and the reactions from our fans, these are the songs they liked the most," Dushan Petrossi explains. "Nevertheless, we wanted the album to sound 100% authentic and typical IRON MASK. I think this is very much what we achieved in the end with Fifth Son Of Winterdoom. One of the album's lead tracks is "Rock Religion", a Power Metal hymn with memorable chorus, powerful drumming and positive energy." A video clip was filmed for this song, too, which you can check out right HERE. In the heartfelt ballad Father Farewell Petrossi mourns the loss of his father who passed away last year, long songs like the title track or "The Picture Of Dorian Grey" deliver the epic feel and straight-ahead rockers like "Angel Eyes", "Demon Soul" and "Back Into Mystery" are typical IRON MASK anyway. Add to this the slightly progressive touch of "Seven Samurai", the rawness of "Only One Commandment" and the fast-paced "Like A Lion In A Cage", it becomes obvious that Fifth Son Of Winterdoom is another versatile release of a band that just seems to get better and better. IRON MASK´s debut album, Revenge Is My Name, was released in 2002. Three years later the band made the biggest leap forward with Hordes Of The Brave, a strong and versatile neo-classical power metal opus. Here also the collaboration with Oliver Hartmann (AVANTASIA, ex-AT VANCE) began, who from then on sang full songs or provided choir support on the next three IRON MASK records. The break between Hordes Of The Brave and Shadow Of The Red Baron was more than four years because of a death in the family of Petrossi. But the reactions on Shadow Of The Red Baron were again excellent, and the band really began to blossom. The step out of the underground was done with the Black As Death album (released in late 2011), which was not only IRON MASK's first album for AFM Records but also the first with legendary Mark Boals (ex-Yngwie Malmsteen) on vocals. To prepare for the Fifth Son Of Winterdoom recordings, the band played a short tour in Europe in Summer 2013, with concerts and festivals in Germany, Belgium and the Netherlands. But this should only be the start for much more to come. "Like A Lion In A Cage"